Thought I would share a couple of cards that I have made recently. 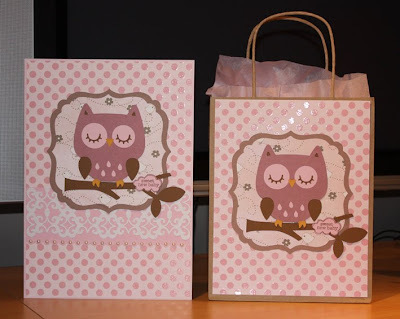 We are expecting the arrival of our new baby niece anyday soon, so the pink owl card and matching gift bag are ready and waiting for her! The sleepy owl was cut on my Cricut from the Create a Critter cartridge, and the papers were from my stash - I think the little birdy paper was from Sassafrass and I seem to remember I bought this when I first started scrapbooking, so it is nice to finally use it! Hopefully I will be able to add the baby's name to the card somewhere once it has been announced! The second one is for another friend of ours who is due in about a month, but she has decided not to find out the flavour before hand! 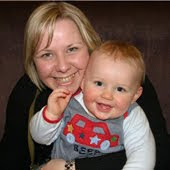 I thought greens and yellows would be OK for this one as they will suit either a boy or a girl. 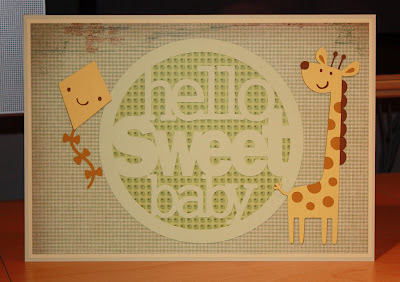 The giraffe and kite are also from the Create a Critter cartridge, and the Hello Sweet Baby sentiment was cut on the Craft Robo from a Silhouette template. Paper from my stash - think it is mostly K&Co on here!